An interactive table-top exhibit of black memorabilia spanning slavery to hip hop. Includes a eight hour exhibit and one hour lecture by professor and museum curator, Khalid El-Hakim. The Black History 101 Mobile Museum (BH101MM) is an innovative traveling tabletop exhibit depicting Black memorabilia spanning slavery to Hip Hop. The mobile museum is a cost effective approach to present historical artifacts to schools systems, communities, colleges and universities throughout the nation. The museum has over 5,000 rare treasures among its collection, including original documents from historic Black figures whose contributions helped shape the United States. 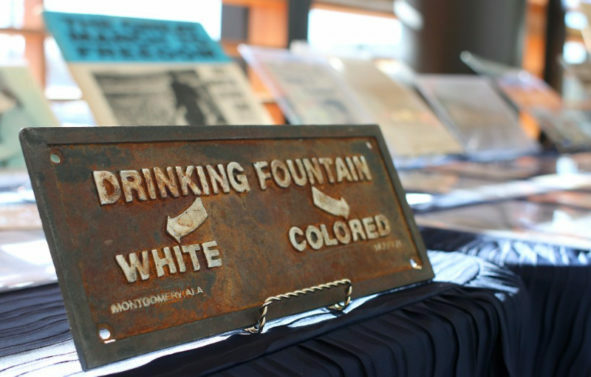 Artifacts in this unparalleled mobile collection represent items from the categories of slavery, Jim Crow era, music, sports, the Civil Rights and Black Power era, and popular culture. A few prominent pieces in the collection’s archives include a rare slave bill of sale and documents signed by Booker T. Washington, Ralph Bunche, Rosa Parks, The Honorable Elijah Muhammad, Malcolm X, Muhammad Ali, Shirley Chisholm, Dr. Dorothy Height, Alex Haley, Carter G. Woodson, and many others. In 2011, Khalid el-Hakim, the museum’s founder and curator, celebrated the twentieth anniversary of the BH101MM. Inspired by Dr. David Pilgrim, his former Ferris State University professor, el-Hakim stands on the shoulder’s of the great archivist of Black culture and history such as Arthur Schomburg, Dr. Margaret Burroughs and Dr. Charles Wright. Khalid has been called “the Schomburg of the hip hop generation”. Take a glimpse at one of the many exhibits presented by museum curator and professor Khalid El-Hakim. In the past twenty years, he has been able to collect over 7,000 artifacts related to black history, that fill in the missing links of a story that needs to be preserved and learned from.